The Hotel Orrington - "Evanston's Finest Luxury Hotel"
In early 1920, business developer Victor Carlson, of the Carlson Corporation, had a vision of a full-service luxury apartment/hotel with all the amenities and modern conveniences of the day. Having already opened the Library Plaza hotel at 1627 Orrington in 1922, The Orrington Hotel was the second in Carlson’s series of buildings that would make up “Library Square” in Evanston’s downtown prime business district. After a record time of only ten months in construction, the brand new, $2 million Orrington hotel hosted its grand opening to over 500 guests and invitees on Saturday, September 22, 1923. Equipped with 300 transient rooms, 75 apartments, and a rooftop garden overlooking Lake Michigan, the Orrington had staked its claim as “Evanston’s Finest Luxury Hotel”. The hotel was named in honor of Orrington Lunt, a generous, well-known philanthropist and co-founder of Northwestern University. As one of many businesses that had fallen victim to the stock market crash in 1929, the Carlson Corporation was dissolved in 1930 and the Orrington Hotel was sold to architect Benjamin Marshall of Wilmette. Known in some circles to live a “Jay Gatsby” lifestyle, Mr. Marshall had a flair for acquiring high-end hotels and making them even more fabulous and better known to the Chicago area. His architectural firm designed the Blackstone Hotel and The Drake Hotel where he lived until his death in 1944. New owner Earl Zweifel, of the Zweifel Corporation, took over management and controlling interest of the Orrington in 1959. 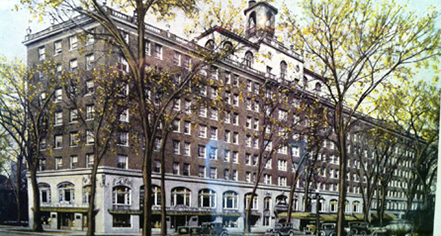 In 1961, the Zweifel Company bought the Orrington and quickly started to make major renovations, including the vast remolding of the hotel’s lobby, the addition of a street-level sidewalk café, and a new indoor pool located in the hotel’s basement. The pool has since been closed. Mr. Zweifel had made plans to introduce a new club called the Gay Shay in hopes of bringing alcohol sales into the otherwise dry town of Evanston, but the opening was denied by City Council due to pressure from interest groups. In 1977 attorney Paul Wilcher took ownership and had visions of revitalizing the hotel’s rooms, lobby, hallways, and façade. Unfortunately, only a portion of the rooms and just a few areas of the hotel were able to be refurbished before the hotel was once again for sale. After a couple of years in legal maneuvers, the Orrington was acquired by The Management Group in 1982. With a $10 million purchase and renovation plan, The Management Group started a major renovation, from the top down, and the hotel officially re-opened in 1983. The room count was reduced from over 300 to 280 accommodations. The new owners even made sure vintage automobiles were parked outside the hotel to bring back the idea that the Orrington was returning to its original glory, reminiscent of its very first grand opening. In 2003 the Orrington was purchased by the Greenfield Partners who reduced the room count to 269 to make way for the addition of new suites. They also removed the double staircase that led to the second floor, near the hotel’s main entrance, and added the Indigo lounge in the lobby. The globe Café replaced the Wedgewood restaurant and Huddle bar became an annexed area called the “Den”. One of the most exciting additions was the new 19,000 square foot, technologically adept, state-of-the-art conference center on the entire ninth floor, which includes an auditorium for larger meetings and events. In 2010 the Orrington joined the Hilton Family brand of hotels and the name was changed, as it is known today, to Hilton Orrington/Evanston. 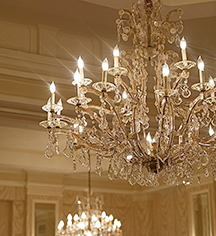 Though there have been many changes through the years, each owner has tried to stay true to the original charm and attraction of the hotel from the European-style bathrooms to the beautiful grand staircase in the Grand Ballroom. Many generations have enjoyed the service and hospitality of the Orrington hotel, from brides and grooms to politicians, celebrities, scholars, and business and leisure guests. No matter the title each visitor, that has passed over the threshold of this brick and limestone, Georgian-styled building, has felt the warmth and light of the hotel’s hospitality. As it was in 1923, it is still to this day “The Hotel Orrington – Evanston’s Finest Luxury Hotel."